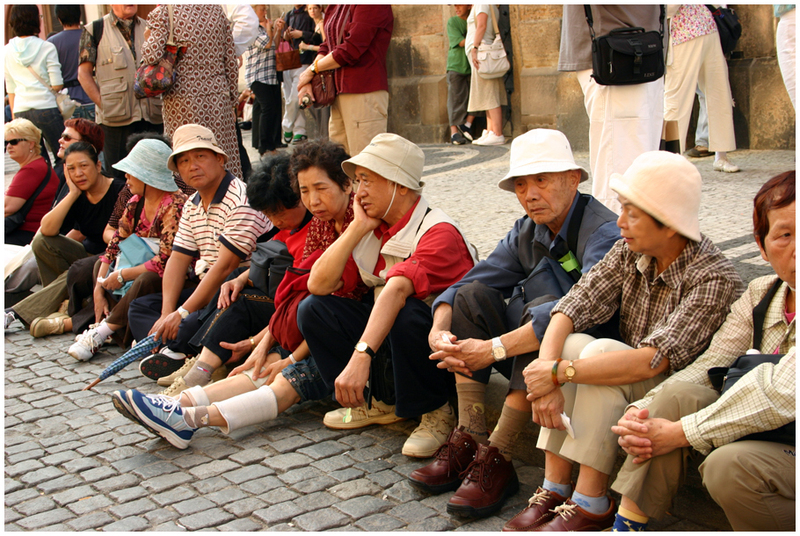 Here’s an astonishing fact: the crime rate among Japan’s elderly is on the rise. And among an rapidly aging population with long life expectancy, that’s a problem. The island nation is famed for its nagaiki (長生き, longevity) with, as of 2013, a life expectancy of 86.61 years for women and 80.21 years for men. The oldest gen’eki (現役, active) doctor — Dr. Shigeaki Hinohara of St. Luke’s International Hospital — is 101 years old, and he’s still publishing books and going on tours where he lectures mostly about how to live out your twilight years with health and happiness. Unfortunately the good doctor is more the exception than the rule. The other day, I witnessed an incident on a train along Tokyo’s Yamanote Line. A man in his 70s was hollering at another man young enough to be his grandson: “Nanisamano tsumorida (何様のつもりだ, Who do you think you are)?” Apparently the youngster was in the yūsenseki (優先席, priority seating) and failed to get up when the elderly man boarded the train and stood pointedly in front of him. It’s likely the younger man — plugged into earphones, with eyes kept firmly on his smartphone screen — just didn’t notice and warugi wa nakatta (悪気はなかった, did not mean to offend). But his accuser didn’t read the situation like that; apparently he felt ignored, insulted and passed over. Japan’s chōkōreishakai (超高齢社会, super-aged society) is taking its toll and the recent increase of kireru rōjin (キレる老人, old people who are easily angered) is no coincidence. In the last 20 years, the number of seniors arrested on assault charges has increased by around 48 times, according to an NHK survey. When you stop to think about it, that’s pretty scary. According to that NHK-conducted survey, incidents of minor violence and verbal abuse instigated by seniors occur most frequently in hospitals. The typical angry otoshiyori (お年寄り, reverent old person) is apt to lose control when lines are too long, when the attitude of a kangoshi (看護師, nurse) isn’t up to par or due to 100 other inconveniences that the rest of the world simply deem a regular part of hospital life. The elderly of today spent their youths and middle-aged years entrenched in Japan’s rapid-growth era. Their generation believes hard work and social status equals respect and entitlement. These are also the people rumored to be the last generation able to draw their full share of Japan’s kokumin nenkin (国民年金, national pension plan). Young people in their 20s and 30s, however, are looking at an increasingly uncertain future, defined by the fear of kakuosen (核汚染, nuclear contamination), the certainty of hinpu no sa (貧富の差, income gap), the possibility of war and a collapsed pension-plan system that could cripple their post-retirement years. So there is no love lost between the two generations. The younger people view the affluent older generation as the yūyūjiteki sedai (悠々自適世代, generation that lead a leisurely life with ample free time and money). This “leisurely” generation, on the other hand, look upon the young as weak, spineless and undeserving. The urge to start preaching “Orega wakakatta korowa (俺が若かった頃は, Back when I was your age),” followed by endless stories of studying hard and working their backsides off, is so prevalent among the elderly that an uncle of mine says he has to bite his lip at family dinners and leave the room to keep from losing it entirely. There’s a lot of pent-up rage and frustration among the ranks of the elderly. On the other side of the generation gap, the young resent the elderly for having it all their own way and leaving the bill with the next generation. It’s little wonder then, that cases of furikome sagi (振り込め詐欺, bank-transfer scams) have their roots in the notion that it’s okay for the young to con the elderly, in the same way that it was okay for Robin Hood to steal from the rich. 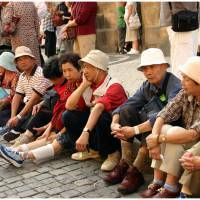 Japan is supposedly a society that reveres the elderly. In fact, history is crammed with evidence to the contrary. Young and old have been at each other for centuries, but in a few decades Japan’s seniors will become the majority, while people under 40 will feel their size shrinking like a rayon shirt in a tumble drier. In the meantime, the otoshiyori are getting madder and they’re not shy about expressing it. Can we all be friends? After witnessing that little scene along the Yamanote Line, the forecast looks gloomy.